La Salle's Santi Santillan finished with 20 points and 6 rebounds in a loss to FEU on Wednesday, his last UAAP game. Josh Albelda, ABS-CBN Sports. 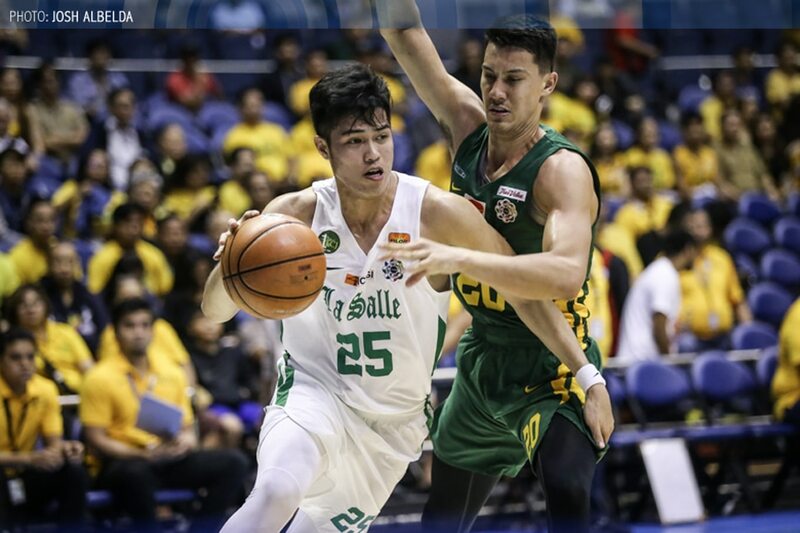 MANILA, Philippines—De La Salle big man Leonard "Santi" Santillan is ready to move on to the next phase of his basketball career, even as he lamented the sorry miss that ended their campaign in the UAAP Season 81 men's basketball tournament. Down 71-70 to Far Eastern University in a playoff game for the last semifinal spot, Santillan caught an inbound pass from Aljun Melecio but found himself too deep under the basket. Nevertheless, he was still able to throw up a shot, despite being bothered by FEU's Richard Escoto and Barkley Ebona. Unfortunately, the ball just grazed the side of the rim before being secured by an FEU player as time expired. "Ganoon talaga," Santillan said afterward. "Wala tayong magawa doon." " 'Yung last shot ko naman, talagang sure ball na 'yun eh," he added. "Wala eh. Di pumasok. Ganoon ang laro — may nananalo, may natatalo." "Ginawa namin ang lahat ng makakaya namin para makapasok sa final 4." It was a sorry ending to what had been a great performance from Santillan. He scored a game-high 20 points, making six of his 12 shots, and grabbed six rebounds in just under 29 minutes of action for the Green Archers. But no other La Salle player reached double digits, with Aljun Melecio (9 points on 3-of-11 shooting) and Justine Baltazar (6 points, 3-of-10 from the field) struggling against FEU's stout defense all throughout the game. Still, Santillan has no regrets. The power forward, who memorably shed tears after La Salle's triumph over National University last November 7, was thankful just to have gotten the chance to play in Manila. "Di ko ito ine-expect, na mag-Maynila ako," said Santillan, who played two seasons for La Salle. "Iniisip ko lang, nasa Cebu lang ako. That time na nakalaro ko 'yung La Salle, kinuha nila ako." "Hindi ko inasahan 'yung opportunity sa La Salle," he admitted. "Nagpapasalamat din ako sa mga coaches na naniwala sa akin at sa mga teammates ko na naging kapatid ko." "Syempre malayo ka sa pamilya, 'yun lang. Alam nila lahat ng pinaghirapan ko, sakripisyo ko. And'yan sila parati para sa akin." Santillan now plans to declare for the PBA D-League draft, along with fellow graduating Green Archer Kib Montalbo.